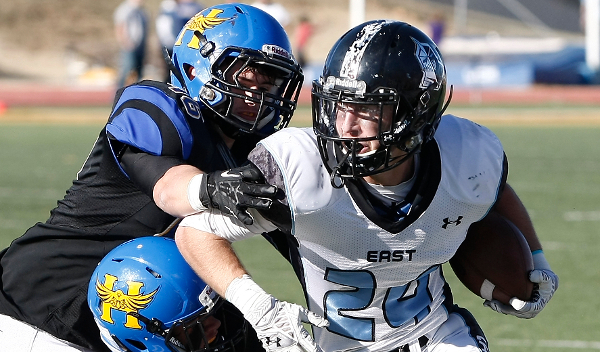 The 2014 Kansas high school football season has come to a close as state champions were crowned in the six 11-man classes this past weekend. Three teams highlighted as preseason No. 1’s in the Kpreps.com rankings captured state titles this fall, while three more teams ranked No. 2 at the beginning of the season won state titles. The other two classes were won by teams ranked No. 3 and No. 4 in our preseason poll. Let’s take a look at the final rankings for the 2014 season. Shawnee Mission East began the season ranked second in our 6A poll, but the Lancers quickly took over the top spot and never relinquished it. Shawnee Mission East won their first state football championship with a 33-14 win over Hutchinson in the 6A title game. The Kpreps preseason favorite, Olathe North, finishes the season ranked second after a 36-35, double overtime loss to SM East in the state semifinals. Blue Valley began the season at No. 3 and finishes there as well. The Tigers went 9-2 and gave up two late touchdowns to Olathe North in losing in the state quarterfinals. Hutchinson finishes ranked No. 4 in the poll after overcoming injuries to reach the 6A title game. The Salthawks finished 8-5 on the season. They eliminated No. 5 Lawrence Free State in the state semifinals. Bishop Carroll went wire-to-wire as the top team in Class 5A this season as Alan Schuckman’s Eagles won a second state title in three years with a 39-7 win over St. Thomas Aquinas. The Eagles actually trailed Aquinas 7-6 at halftime before scoring five times in the second half. St. Thomas Aquinas finishes as the No. 2 team and state runners-up in Randy Dreiling’s first season. The Saints overcame countless injuries to key players to finish 9-4. Salina South finishes the season ranked third, while Shawnee Heights and Pittsburg round out the 5A poll at No. 4 and No. 5, respectively. Bishop Miege completed a dominant season in Class 4A-I by holding off Topeka Hayden, 42-35. The Stags built a 14-point lead in the fourth quarter and allowed only a late Hayden touchdown with 35 seconds remaining. Miege held the top spot in the Kpreps rankings all season, while Hayden finishes ranked second after beginning the season in the No 2 spot as well. KC Piper enjoyed another strong postseason run and finishes ranked third after reaching the state semifinals. The 2013 4A champs, Buhler, finishes the season ranked fourth after losing to Hayden in the state semifinals. Buhler began the season ranked No. 4, while Piper was ranked third. The Fort Scott Tigers round out the poll at No. 5 after finishing 9-2 with losses to ranked teams in Pittsburg and Bishop Miege. Andale claimed the first ever 4A-II championship by beating Columbus 49-6. The Indians were the top-ranked team all season in the Kpreps 4A-II poll and only one team played within 21 points of them this season. Columbus finishes ranked second in the 4A-II poll after reaching the state championship game for the first time in school history. The Titans began the season ranked third and knocked off No. 3 Holton 22-21 in the state quarterfinals. Holcomb finishes No. 4 in the poll after a 10-2 season under new head coach Kent Teeter. Finally, Santa Fe Trail completed a spectacular turnaround by reaching the state semifinals. The Chargers entered this season having won just 10 of their past 90 games over the past 10 seasons, but finished 9-3 and ranked fifth. Rossville won their first state football championship with a hard-fought 21-14 win over Scott City at Gowans Stadium in Hutchinson. Tucker Horak scored on a 5-yard run with 28 seconds remaining to lift the Bulldogs to the win. Rossville, which began the season ranked No. 2, defeated rival Silver Lake twice this season on their way to the title. The Bulldogs finally got past the Eagles in the state semifinals after losing to Silver Lake eight times in the previous 12 seasons in that round. Scott City finishes ranked second after reaching the title game for the second time in three years. Surprising Halstead finishes at No. 4 after a special playoff run to the state semifinals before falling to Scott City in overtime. The Dragons will return two of their top offensive threats next season in Blake Beckett and Eli McKee. Wichita Collegiate finishes ranked fifth after the Spartans were eliminated by Scott City 26-6 in the state quarterfinals. Collegiate is the only team to really test 4A-II champ Andale this season; falling 34-28 back in Week 3. The Olpe Eagles began the season ranked No. 3 in the Class 2-1A poll, but end up on top with their first ever state football championship. Olpe held off Ell-Saline 26-24 to win the title at Lewis Field on the campus of Fort Hays State University. Ell-Saline, unranked in the preseason, used a special playoff run and nearly came away with the title. The No. 2 Cardinals scored with 26 second remaining to pull within two points, but could not connect on the two-point conversion to tie. Phillipsburg began the season ranked No. 4, but spent plenty of time in the top spot. The Panthers fumbled on the 1-yard line with 14 seconds remaining in the state semifinal loss to Ell-Saline. Phillipsburg finishes its first season in 2-1A ranked third. The Troy Trojans enjoyed their best playoff run in school history and finish No. 4 in the poll. Troy lost to Olpe 36-28 in the state semifinals. Finally, La Crosse finishes ranked fifth after beginning the season as the No.1 team. The Leopards were beaten 28-12 by Ell-Saline in the state quarterfinals. Two weeks ago, Central Plains won the 8-Man, Division I title with a 42-30 win over No. 2 Hanover. The Wildcats pulled to within 36-30 with 1:30 remaining, but Oiler wideout Layne Bieberle took a direct snap 45 yards for a game-sealing touchdown. Central Plains began the season as the No. 4 ranked team, while Hanover was ranked No. 2. Spearville ends the season ranked No. 3 after being eliminated 42-40 by Central Plains in the state quarterfinals. Osborne, the 2013 champions, finished ranked fourth, while 2012 champ Ness City is fifth. Victoria held the high-powered Argonia-Attica offense to just eight points in the 52-8 championship victory. The Knights began the season ranked No. 2 in the Kpreps poll, but finished on top with their sixth state football title. Sharon Springs-Wallace County finishes ranked No.2 after a 28-12 loss to Victoria in the semifinals. A&A is ranked third, while Axtell and Chetopa round out the Division II poll.